The Milwaukee M18 FUEL HIGH DEMAND 1-1/2" Magnetic Drill Kit (2787-22HD) delivers the strongest magnetic hold on 1/4" steel providing a safer drilling environment in this material, and drills over 75 13/16" holes per charge. By utilizing permanent magnets, the magnetic base operates without electricity; ensuring that the magnet does not deactivate if the battery is drained. 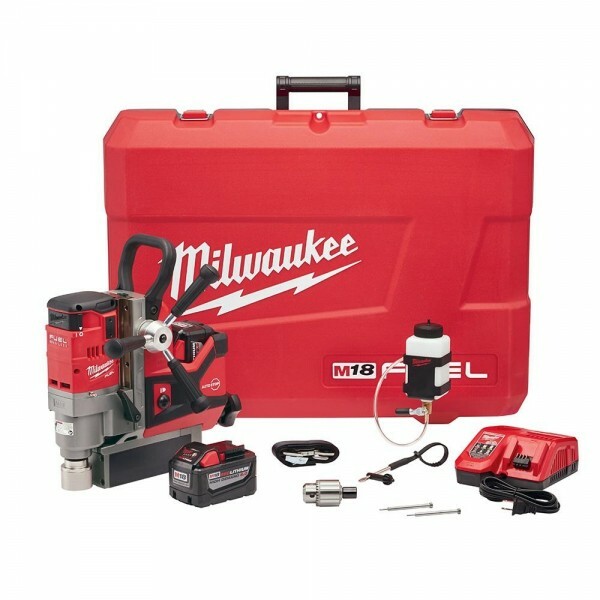 Equipped with auto-stop lift-off detection, power to the motor is automatically cut if excess rotational motion is detected while drilling/ Powered by a Milwaukee POWERSTATE brushless motor, both drills are faster than their corded counterparts, and deliver the same 1-1/2" annular cutter capacity. REDLINK Plus Intelligence is the most advanced electronic system on the market, preventing damage to the tool and battery caused by overloading or overheating. The M18 REDLITHIUM HIGH DEMAND 9.0 battery pack maintains full power and runs substantially cooler through heavy applications, allowing users to push their cordless tools harder and longer than ever before. Click the button below to add the Milwaukee 2787-22HD M18 FUEL HIGH DEMAND 1-1/2" Magnetic Drill Kit to your wish list.